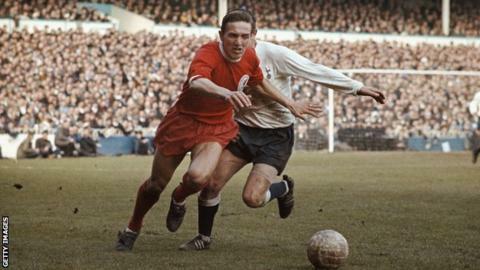 Former Liverpool, Preston and Bolton winger Peter Thompson has died aged 76. Thompson scored 54 goals in 416 appearances for the Reds between 1963 and 1973, and won two First Division titles under Bill Shankly. He helped Liverpool win the FA Cup for the first time in 1965 and reach the European Cup Winners’ Cup final in 1966. He was capped 16 times by England under World Cup-winning manager Sir Alf Ramsey. Thompson was named in Ramsey’s initial 28-man squads for the 1966 and 1970 World Cups but was cut from the final 22 for both tournaments. Liverpool said they were “deeply saddened” by his passing and described Thompson as “a shining light for much of Bill Shankly’s reign as Reds manager”. Shankly, who died in 1981, once said of Thompson: “He could run forever, but more importantly in football he could run with the ball – probably the hardest thing to do. “He could run every minute of every game, every week, every year better than anybody else. Born in Carlisle, Thompson started his career at Preston, becoming a first-team regular at 17 before going on to score 20 goals in 121 appearances. Following his 10-year spell at Anfield, he joined Bolton in 1973 before retiring in 1978. Peter Thompson was a key component in Bill Shankly’s first great Liverpool side, a player who would now be called an “old-fashioned” winger but who was at the forefront of an Anfield revolution that brought two titles and an FA Cup in the 1960s. A classic touchline-hugging wide man, Thompson was a dazzling dribbler and a scorer and creator of goals alongside the likes of Roger Hunt, Ian St John and Ian Callaghan. Thompson was unlucky to twice miss the cut on England’s World Cup squads in 1966 and 1970 when Sir Alf Ramsey shied away from using conventional wingers, but he was a regular on the international scene and will be recalled fondly as one of Liverpool’s finest players. It is also often overlooked that he continued to have a fine career at Bolton Wanderers after he left Liverpool, but it was for his deeds at Anfield that Thompson will be best remembered.